Today’s Rehab At Home post is about “Expansion and Extension“. This is another strategy you can use at home with your child to develop their use of spoken language. If your child is using single words, short phrases or sentences, the use of “Expansion and Extension“ can encourage them to use longer phases/sentences and more complex vocabulary. Why Is “Expansion and Extension” Important? “Expansion and Extension“ is a natural way to develop your child’s vocabulary and use of spoken language. A typically hearing child learns many words through overhearing the more complex conversations going on around them. Children with hearing loss may miss out on this information. “Expansion and Extension“ is one way that you can provide your child with more complex language in an interesting and natural way. How Can I use “Expansion and Extension” with my child? Expand what they have said by making their phrase grammatically correct. For example, if your child says “cat eat”, you could say “Yes, the cat is eating”. You have acknowledged what your child has said and provided the correct “adult” sentence. Extend what your child said by making their phrase grammatically correct and adding more information. For example, if your child says “Daddy go”, you could say “Daddy is going to work”. Remember to do so in a conversational tone, rather than correcting your child or expecting them to repeat your phrase. By expanding and extending your child’s phrases like this, you can model the correct sentence forms, and add more complex words or language, while your child is focused with you on a fun activity. Matthew’s mum does a great job expanding on and extending Matthew’s phrases in this video. She says his phrases back to him with the correct grammar, and then adds more information. Here are some other ideas for using “Expansion and Extension” with your child. What Activities Can We Do With Younger Children? At meal times, encourage your child to request their needs. If you child says “drink”, you can expand this by saying “a drink please”. Or extend this by saying “A drink of water please”. When getting dressed, if your child says “sock”, expand and extend this by saying “Yes, put the socks on”. What Activities Can We Do With Older Children? When talking about your day together, if you child says “I go park”, you can expand and extend this by saying “You went to the park with Grandpa”. When driving in the car and talking about what you can see, if you child says “big truck”, you can expand and extend this by saying “I can see a big truck. It has cows in the back”. Listen out for grammatical markers in your child’s sentences such as ‘a’, ‘the’, ‘is’, ‘are’, plural ‘s’ as in “cats”, and tense markers as in “jumping” and “jumped”. If your child is not using these yet, expand their sentences so that they hear how they should be used in conversation. Interested in more from Rehab At Home? Check out all the videos on our Rehab At Home intro page. 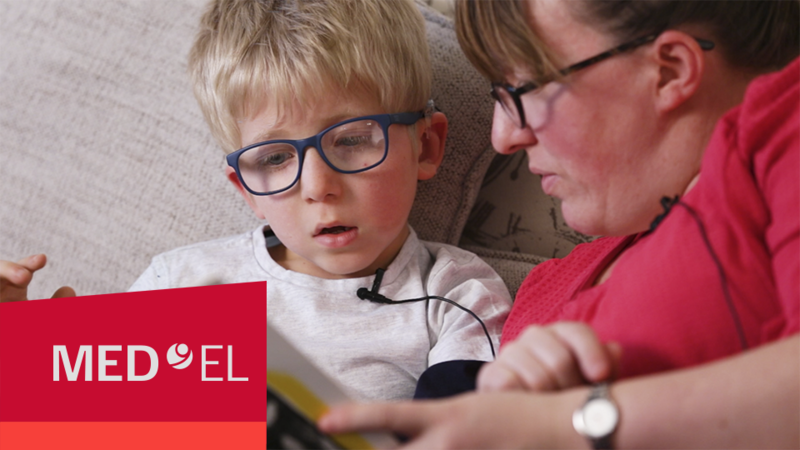 Find out more about how cochlear implants work and how they could help you or your child. Natalie Teakle is a Speech and Language Therapist, and currently works as a Rehabilitation Manager at MED-EL headquarters in Innsbruck, Austria, providing hearing implant rehabilitation training support globally. Natalie enjoys being able to provide support and training to professionals around the world so that children with hearing impairment have great outcomes.